10.5 Kucinich and communists, kindred spirits? 12 "Andean Region Contractor Accountability Act"
13 "WAKE UP DEMOCRATS! Take Back the Country"
21 Assisting CODEPINK's "Fallujah Aid"
Dennis John Kucinich was a Democratic member of the United States House of Representatives, representing the 10th district of Ohio. Kucinich was defeated by fellow Democratic incumbent Marcy Kaptur in the 2012 Primary for the 9th congressional district of Ohio. Dennis Kucinich was elected to the Cleveland, Ohio City Council at age 23 and was elected mayor in 1977 at the age of 31. At the time, he was the youngest person ever elected to lead a major American city. ...tireless advocate for worker rights, civil rights and human rights. Kucinich has been honored by Public Citizen, the Sierra Club, Friends of the Earth and the League of Conservation Voters. Kucinich has twice been an official United States delegate to the United Nations Convention on Climate Change (1998, 2004) and attend the 2002 World Summit on Sustainable Development in Johannesburg, South Africa. ...tireless advocate for the social and economic interests of his community. In 1998 Dennis Kucinich Democrat was listed as a vice chair of the Congressional Progressive Caucus. As of November 16, 2009, Kucinich was listed as a Vice Chairof the Congressional Progressive Caucus. The Council for a Livable World, founded in 1962 by long-time socialist activist and alleged Soviet agent, Leo Szilard, is a non-profit advocacy organization that seeks to "reduce the danger of nuclear weapons and increase national security", primarily through supporting progressive, congressional candidates who support their policies. 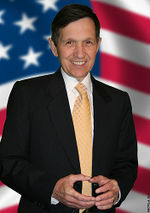 The Council supported Dennis Kucinich in his successful House of Representatives run as candidate for Ohio. Speaking to a crowd of 200 peace activists March 11, in Oakland California, Reps. Barbara Lee (D-Calif.) and Dennis Kucinich (D-Ohio) took the occasion to condemn the Bush administration’s plans to target seven nations with nuclear weapons. They were joined in their stand by Communist Party USA affiliated activist Jackie Cabasso, spokesperson for the Peoples Non-Violent Response Coalition, organizer of the event, who said, “The U.S. position needs to be condemned today, immediately! We need a Department of Peace, but we need some interim measures in the meantime.” The PNVRC was formed in the wake of the events of Sept. 11 to promote non-violence as the answer to terrorism. The bill (HR-2459) that would set up the Department of Peace was introduced in Congress on July 11, 2001 by Kucinich; at that point there were 61 co-sponsors, including Lee. The bill would order the federal government to set up a $3 billion a year agency with a Secretary of Peace who would be a member of the President’s Cabinet, and seven assistant secretaries. The mission of the Department would include: hold peace as an organizing principle; endeavor to promote justice and democratic principles to expand human rights; develop policies that promote national and international conflict prevention, non-violent intervention, mediation, peaceful resolution of conflict, and structured mediation of conflict. The forum was moderated by leftist Oakland City Councilmember Nancy Nadel. Oakland teacher Jessica Wright, also spoke of the need to involve young people in peace work. Dennis Kucinich has reportedly been close to the Communist Party USA since his days in Cleveland Ohio council politics in the 1960s. Take Kucinich first. As mayor of Cleveland in the late 1960s, he represented one of the most “left” elements in the Democratic Party during the heyday of the radical protest movement. He was closely allied with the Stalinists of the CPUSA, who still had significant influence in the working class of Cleveland, particularly in such unions as the UE and UAW. With the collapse of the protest movement and the shift to the right in American bourgeois politics, Kucinich was driven out of political life for two decades, before returning to office as a state legislator and ultimately winning a congressional seat. 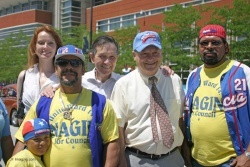 In 1994 Kucinich won a seat in the Ohio State Senate, with strong labor backing, especially from the International Brotherhood of Electrical Workers local 30, who canvassed door to door, in two Cleveland neighborhoods. Kucinich not only motivated people to vote - he motivated an army of 1000 volunteers, drawn in considerable measure from labor and grassroots organizations...The Kucinich election shows the tremendous potential for working class and labor candidates. It shows that big business, even with their vast resources can be decisively beaten..."
During Kucinich's 1996 Congressional run, there was considerable controversy over his ties to Communist Party USA member Rick Nagin. Many organizations also issued their own literature and did their own mailings including the AFL-CIO's Labor '96, the UAW CAP Council, the Sierra Club, Peace Voter '96, gay rights and senior groups. The United Auto Workers and the Steelworkers did plantgate distributions. The Ohio Council of Senior Citizens distributed 12,000 pieces with the positions of Kucinich and his opponent, incumbent Martin Hoke, on senior issues to senior buildings, nutrition sites and bingo games. Then First Lady Hillary Clinton, Congressmen Louis Stokes, Joe Kennedy and Barney Frank also helped out. The coalition embraced many political viewpoints: Democrats, independents, Greens, socialists, Communists, members of the Labor Party, even some disgruntled Republicans. Democratic Party figures, including First Lady Hillary Clinton, Congressmen Louis Stokes, Joseph Kennedy and Barney Frank visited Cleveland to help in the effort. The smears were endlessly propagated by a right-wing talk show host who made it his mission three hours every morning to stop Kucinich. The poisonous attacks, aimed at suppressing voter turnout, caused the race to tighten considerably. In the final week before the election the focus of the Hoke campaign shifted to virulent red-baiting directed at this writer. 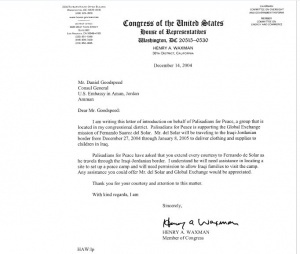 Later, the Communist Party USA itself contradicted Kucinich's claim that Nagin was merely "one of 5,000 volunteers." 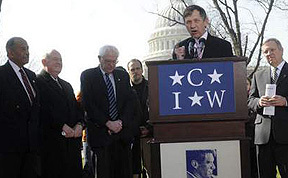 Communist Party USA activist and Steel Mill worker, Bruce Bostick endorses Kucinich in the 2008, video to the right. Kucinich and communists, kindred spirits? The Communist Party USA appears to see Dennis Kucinich as a man worthy of support and someone who can be relied on to push the correct agenda in Congress. In a 2004 report to the CPUSA National Board, the Party's Political Action Committee chair, Joelle Fishman wrote a report on Party work in the U.S. Presidential elections. She included a comment on Dennis Kucinich and the Democratic Party National Convention. We project our role at the convention as distribution of the Peoples Weekly World/Nuestro Mundo and literature to delegates and in free speech areas, and participation in the Kucinich-led issue events. We hope to have reporters inside the convention, we hope to speak with any labor delegates we know in their home states before the convention, and to participate in the Boston Social Forum which will be held the weekend prior to the convention". In a July 2007 report to the CPUSA's National Committee, Party chairman Sam Webb urged fellow communists to "have a positive attitude toward the candidacy of Congressman Dennis Kucinich," characterizing the latter as "a leading voice of the broad people’s coalition." "The more he [Kucinich] speaks to audiences of the core forces," said Webb, "the better positioned the movement will be to win in 2008 and to fight the good fight in 2009." Rick Nagin of the Communist Party USA was Labor Coordinator for Dennis Kucinich's 2008 primary campaign. Dennis Kucinich, (center rear), endorsed Rick Nagin (second from right) in his 2009 City Council race. I've known Rick Nagin for more than 30 years. He's honest, hard-working and conscientious. The people of Ward 14 have a chance to elect a Councilman who will be totally dedicated to them. What more can you ask for? In August 2012, about 20 people spoke at Ohio Communist Party USA member Judy Gallo's memorial. They included her surviving husband and their two sons, Jesse Gallo and Nick Gallo . Others were labor and community leaders including Harriet Applegate, executive secretary of the Cleveland AFL-CIO, representatives of Reps. Dennis Kucinich and Betty Sutton, State Rep. Nickie Antonio and East Cleveland Councilwoman Barbara Thomas, the former president of AFSCME Local 3360 at MetroHealth. The Cleveland club of the Communist Party USA supported Dennis Kucinich’s campaign for governor. Unfortunately, he lost, but the club developed good relationships with his volunteers. One joined the “Better World’s Birthday Party” reading club that meets weekly to discuss Rick Nagin’s new book, “A Better World in Birth: Principles of Scientific Socialism/ A Handbook for Revolutionary Change”. The reading club was organized by one of the club members, mostly in their 20’s. They meet every Sunday and has grown to 15 participants. This could become the basis for forming a new party club. This discussion is building understanding of the importance of grass roots movements, being active in the elections as well as the need for socialism. Democratic Socialists of America backed Dennis Kucinich nationally with his 2002 HR2459 Vaccines Compensation bill. 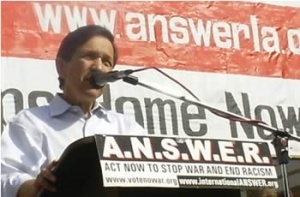 Dennis Kucinich was on the list of 129 speakers at the 2003 Take Back America conference, which was organized by the Institute for Policy Studies, and Democratic Socialists of America dominated Campaign for America's Future. He was back in 2007. Ohio Democratic Socialists of America backed Kucinich in his difficult 2004 Congressional race. Ohio Progressive Dennis Kucinich is working hard to keep his West Cleveland 10th CD seat after his presidential primary campaign failed to catch fire, and DSAers are committed to returning the firebrand veteran politician and Progressive Caucus co-chair to Congress. The business sessions of the Detroit convention were characterized by cooperation, a sense of everyone working together on projects. Most of the discussion dealt with the 2004 presidential election and the urgency of getting George W. Bush out of the White House. While DSA members are working for various Democratic candidates (especially Howard Dean and Dennis Kucinich), the general consensus was that our organizational priority must be supporting any reasonable candidate against Bush, while at the same time helping to build a broad progressive coalition that can pressure the next president to address our issues. In 2006 Neil Abercrombie and Dennis Kucinich spoke at a Democratic Socialists of America Political Action Committee event in Washington DC at the home of Stewart Mott, for Bernie Sanders. The questions and comments actually had to be cut off to let Bernie get to the plane. There have been two positive developments with respect to health care reform in Congress. First, Representative Dennis Kucinich (D-Ohio) and other progressives on the House Labor and Education Committee were able to insert an amendment into HR 3200 allowing states to opt out of the public option in favor of a state single-payer plan. Secondly, Representative Anthony Weiner (D-New York) was able to persuade Speaker of the House Nancy Pelosi to schedule a vote on HR 676 in September (The Weiner Amendment would replace HR 3200 with HR 676.) in return for voting HR 3200 out of the House Commerce and Energy Committee. In light of these developments, we ask DSA members to participate in the following activities on behalf of health care reform:Call your member of Congress. Demand that he or she support a strong public option, oppose stripping the Kucinich Amendment from the final bill, and support the Weiner Amendment. March with the Health Care for All contingent at the Detroit Labor Day Parade on Monday, September 7th. Dennis Kucinich is on the list of Congressional Representatives who have participated in hearings/briefings since 1998, with the very radical Institute for Food and Development Policy/Food First, founded by Frances Moore Lappe (Democratic Socialists of America, Institute for Policy Studies) and Joseph Collins (Institute for Policy Studies), authors of the book "Food First". Socialist activist Tim Carpenter cut his teeth on campaigns that recognized the connection between transforming politics and transforming the country: as a kid working "behind the Orange Curtain" (in then hyper-conservative Orange County) for George McGovern in 1972 and for the remarkable radical intervention that was Tom Hayden's 1976 US Senate bid. Carpenter was a trusted aide to the Rev. Jesse Jackson's 1988 "Rainbow Coalition" run for the presidency, an inner-circle strategist for Jerry Brown's 1992 presidential run (addressing that year's Democratic National Convention and urging delegates to "Save Our Party" from ideological compromises and corporate influence), a key figure in Dennis Kucinich's antiwar presidential campaign of 2004. Tim Reynolds of the Dave Matthews Band, Ani DiFranco, Michelle Shocked, Willie Nelson, Pete Seeger, Joaquin Phoenix, Shelley Morrison, Staceyann Chin, Danny Glover, Ed Asner, James Cromwell, Mimi Kennedy, Hector Elizondo, Roy Scheider, Elliot Gould, Howard Zinn, Studs Terkel and Barbara Ehrenreich, Wendell Berry, Jack Nelson-Pallmeyer and Michael Males. Ambassador John W. McDonald, longtime U.S. and international diplomat, also thrown his support behind Kucinich. More than 250 U.S. cities took part in the March 20, 2004 Global Day of Action protesting Pentagon wars and occupations. The biggest demonstration was in New York, where 100,000 people marched and rallied. The event was initiated by the International ANSWER--Act Now to Stop War and End Racism--Coalition, and United for Peace and Justice. During the ANSWER segment of the rallies, Brian Becker, a co-director of the International Action Center and member of the ANSWER Steering Committee, applauded the courage of the Muslim community in turning out for the march, given the current repression, surveillance and raids. Palestinian flags flew, and speakers in this segment included Ihab Darwish, Free Palestine Alliance; Lamis Deek, Al-Awda Palestine Right to Return Coalition; Imam Asharaf Uz Zaman, Islamic Circle of North America; Ismail Kamal, Muslim Student Association; Mahdi Bray, Muslim American Society and Freedom Foundation; and Waleed Bader, Arab Muslim American Federation/National Council of Arab Americans. Teresa Gutierrez of the International Action Center appealed to the crowd to boycott Coca-Cola, implicated in the assassination of workers unionizing its Colombian plants. Brenda Stokely, chair of New York City Labor Against the War and president of AFSCME District Council 1707, vowed, "We're going to bring down the imperialist powers who think they have the right to slaughter our children!" Larry Holmes of the International Action Center spoke and a taped message from political prisoner Mumia Abu-Jamal urged resistance to racist oppression, police occupation and imperialist oppression. In the UFPJ segment of the rallies, speakers included Suheir Hamma of Def Poetry Jam; Sinan Antoon, an Iraqi filmmaker; David Cline, national president of Veterans for Peace; and Todd Ensign of Citizen Soldier. Fernando Suarez del Solar of Military Families Speak Out said: "Bush lied. Who died? My son." Also featured were Tony Benn, former member of the British Parliament, representing Stop the War UK; New York City Councilmember Bill Perkins; and U.S. Rep. Major Owens. Rep. Dennis Kucinich, Dorothy Zellner, a Jewish activist, advocated an end to Israeli occupation, and Ziad Abu Rish of SUSTAIN--Stop U.S. Tax Aid to Israel Now--supported Palestinian self-determination. In 2000 Dennis Kucinich took his plan for single payer to the Democratic Platform Committee with a group of people from California including Gloria Allred, Tom Hayden, Lila Garrett. They were called the Progressive Caucus. In 2008, rather than making a serious bid for the presidency himself, Dennis Kucinich urged his supporters to back Barack Obama. Polling about 1% in Iowa just a day before the Iowa Caucuses, Rep. Dennis Kucinich (D-OH) urged his supporters to back him, but in places where they do not have enough votes to make an impact, to throw their support behind Sen. Barack Obama (D-IL). “I have a lot of respect for Congressman Kucinich, and I’m honored that he has done this because we both believe deeply in the need for fundamental change. He and I have been fighting for a number of the same priorities -- including an end to the war in Iraq that we both opposed from the start." In 2004, Kucinich served as a pole to unite left left wing voters behind his campaign-which he then delivered to John Kerry. Kucinich did the same for Barack Obama in 2008. That is, run for the Democratic presidential nomination. Consolidate a base of left wing support, then stand aside, handing that support base to another leftist Democrat with more chance of success. The Communist Party USA seems to have foreseen and approved of this scenario. Bassam Khawam, a former executive director and current board member of the Arab American Community Center for Economic and Social Services (AACCESS-Ohio), said that Tulsi Gabbard's 2017 trip to Syria wasn’t the first trip his Cleveland-based organization has coordinated for U.S. lawmakers to the Middle East. Founded in 1991 to serve the Arab American community in Ohio, AACCESS has organized three trips to the region for Dennis Kucinich, the former Democratic congressman from Ohio, between 2006 and 2011; Khawam said the group did the same for Gabbard, a two-term Democratic congresswoman from Hawaii, because of her expressed interest in the region. Congressmen Dennis Kucinich (D-OH) and Tom Price (R-GA) announced September 22, 2009, the formation of a bipartisan caucus to address issues that areof mutual concern to Russia and the United States and to examine "ways to improve friendship, dialogue and international exchange between the two nations". The announcement comes as Russian President Dmitry Medvedev arrives inthe United States tonight forthe G-20 summit in Pittsburghon September 24-25. “The relationship between the United States and Russia has influenced the path of global development and the course of world politics. Today we announce the bipartisan Congressional Russia Caucus to help make sure that the relationship we share with Russiais equitable and friendly. I look forward to working with Congressman Price and other members who share our goals of ensuring that the future of American-Russian relations is strong and peaceful,” said Kucinich. The Russia Caucus will "serve to maintain an open and constructive relationship between lawmakers from both countries by encouraging dialogue and the free exchange of ideas". Kucinich has been a contributor to the liberal magazine, The Progressive. Rep. Dennis Kucinich, who was been one of the most outspoken critics of the Obama administration's military intervention in Libya, confirmed that he was invited to visit the North African nation in an attempt to end months-long conflict between the Qaddafi regime and the rebel forces who have been aided by NATO air strikes. Kucinich proposed a peace plan in June that called for an immediate ceasefire and offered a framework to achieve reconciliation and national unity. Kucinich authored multiple resolutions to end the Libya mission or handcuff the administration as it pertains to Libya, and he is now suing the administration for going to "war" without seeking proper congressional approval. Democratic U.S. Rep. Dennis Kucinich and a former top State Department official aided Moammar Qaddafi right up to the time that rebels overran the Libyan dictator’s Tripoli compound, papers discovered there have disclosed. Kucinich quickly denied that he had given support to Qaddafi. “My questions about the legitimacy of the war, who the opposition was, and what NATO was doing, were well known and consistent with my official duties,” he said in a statement. According to the papers, he met two senior Qaddafi officials, Abubakr Alzleitny and Mohammed Ahmed Ismail, in the Four Seasons hotel in Cairo on Aug. 2. On that same day Saif, who was considered the Libyan strongman’s heir apparent, appeared on Libyan television to urge his countrymen to continue the fight against the NATO-backed rebels. “The documents appear to indicate that an influential US political personality was advising Qaddafi on how to beat the US and NATO,” reported Elshayyal. A broad coalition says national debt should be reduced through cuts to military spending, bank bailouts and corporate loopholes and end to Bush era tax cuts. A Rally and March will take place on Saturday, December 10, 2011 in Downtown Cleveland calling for No Cuts to Social Security, Medicare, and Medicaid. The event coincides with International Human Rights Day. The rally will begin at Public Square in Cleveland at Noon. A march will follow to the Federal Building on E. 9th street. The rally and march is sponsored by the December 10 Mobilizing Committee, a broad coalition of community, religious, labor and health care organizations. Speakers at the rally will be US Representatives Dennis Kucinich, Marcia Fudge and Betty Sutton. Other speakers will include Harriet Applegate, North Shore AFL-CIO Federation of Labor; Rev. Tony Minor, Metropolitan Lutheran Church; Becka Hawkins, Occupy Cleveland; Khalid Samad, Peace in the Hood; Wynne Antonio, Senior Voice Retiree Council; Nina McLellan, Peace Action; Amy Hanauer, Policy Matters; Debbie Kline, Jobs with Justice; April Stoltz, National Association of Letter Carriers (ret,); David Anthony, Akron Education Association; Rachel DeGolia, Universal Health Care Action Network; Greg Coleridge, Northeast Ohio American Friends Service Committee; and Jerry Gordon, Emergency Labor Network. In 2012, Dennis Kucinich served on the Advisory Board of Progressive Democrats of America. Thank you, Kristine Pagsuyoin, Matt Kuhns, Deb Bysak Sweeney and Donna Kolis. I think everyone who had any involvement in this past election will attest... without you, none of this would have happened and we would NOT have won. Know how much I appreciate all of you!! There are so many others deserving of thanks and praise... Bonny, Pat, Art Pagsuyoin, Susan E. Bradley, Tim, Tim Collingwood, Eric, Charles Milsaps, Erin L. Rader, Matt Marton, Mark Sweeney, Mike Deneen, Mike Foley, Michael Berler, Michael Skindell, Kevin Young, Jennifer Scott, Greg Murray, Lain Pierce, Steve Holecko, Steven Stringer, Brad Presutto, David Nader, Kristin Sullivan Warzocha, Brian Taubma, Lauren Whittingham-Bonse, Laura Rodriguez Carbone, Sarah Kolberg, Stanley D. Austin, Vonni Rubin, Rosemary Palmer, Chris Feighan, Kate McCarthy, Lorita Green, Veronica Cole, Kathy Sinatra-Curran, Casey Davis, Bill Grulich, DL Meckes, Pam Wetula, Dan Alaimo, Dan Ramos, Jeanette Riffle, Keith Mundy, Marc Dann, Dennis Kucinich, Nina Turner... And so many others!! AND of course, my beautiful and supportive wife Caitlin Rader, I love you and thank you! !